There have been a number of songs written about various dance crazes with the twist being the most notable, this week’s single suggestion was written about a sporting type craze that had just begun in America and was about to take off in the UK. The craze in question was the skateboard which initially began in California in the late 1950s, but only really took off in the late 70s. 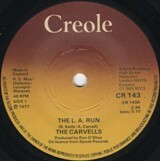 The track was first released on the Mercury label in Germany and the Netherlands under the title Run Run Run (Down the L.A. Run), a couple of months later it was picked up in the UK by the fledgling Creole label who released it without the parenthesis. The label had a limited budget and an odd direction in terms of genre initially beginning with some disco tracks and then re-issuing classic reggae and rock ‘n’ roll songs including Desmond Dekker and Little Richard. Creole charted 27 hits with only two top 10s – Ruby Winters’ I Will in 1977 and The Pinkees’ Danger Games in 1982. If the label had more of a budget it might have helped the song get higher than number 31 even though it did have one appearance on Top of the Pops. Elton John’s Rocket record label released an album by The Carvells to cash-in on the skateboard craze and it was very much in the vain of the Beach Boys but a whole album of the same theme was wearing a bit thin unfortunately. Alan went on to do a lot of session work as well as some one man shows covering Four Seasons, Beach Boys, Johnny Cash and Motown classics. Stapleford became an IT technician at West London College and then an engineer at UK’s first art music radio station, Resonance FM. Griffiths moved to Tennessee and became a professional photographer.